The Phonak Marvel M90 is the premium model from Swiss manufacturer Phonak, launched November 2018. Much of this article will apply to the other aids in the Marvel range, the M70, M50 and M30. Differences will be noted on the individual product pages, but our focus today is on the top model the M90 and the rechargeable version the M90-R. In November we received our demonstration pair which were the Phonak Audeo M90-R and as usual with a new product we programmed them for my mild hearing loss and set about testing them in a number of environments over the next few weeks. As part of my job, I spend a lot of time on the phone talking to our customers and other audiologists, I have both Apple and Android devices (work and personal phones) and I'm only usually able to stream calls from my iPhone when using other hearing aids. The Marvel uses what is called "Bluetooth classic protocol". This has some downsides such as higher battery drain, but does enable these hearing aids to stream sound from almost any device with built in Bluetooth capability such as older phones like Blackberry's and importantly most Android phones. It also streams from most PC's, laptops, tablets and Smart TV's. This meant that I could use my Android phone to take work calls and stream the sound directly through the hearing aids, with audio going in stereo to both ears. The sound quality was excellent with voices coming through crisp and clear with no distortion. Even more impressive was that I could leave my phone on the desk, the hearing aids picked up my voice through their microphones so that I didn't need to have the phone near to my mouth. I speak to a lot of people with hearing losses and they had no more trouble than usual in picking up my voice this way. I don't use many functions on my smart TV, I can barely navigate Netflix, however the setup of the Bluetooth streaming was very straightforward. Sound quality watching films was amazing, the speech came through nice and clearly even with the ubiquitous background noise and music present in most TV programmes these days. If you would find setting this up with your own TV a bit daunting, don't worry, we can do that for you. I use a maps app on my phone. I hadn't particularly noticed before that the phone reads out the directions as you go. I tend to just follow the line. It was a bit of a surprise when the voice appeared in my hearing aids. This wasn't especially useful for me, but if you have trouble hearing directions then it could be. This next generation Lithium-ion rechargeable battery lasts a long time. Phonak estimate 24 hours, even with heavy streaming. I intentionally left it off the charger for longer than 24 hours and it was still working, though it should be noted that my hearing loss is mild so therefore the aids were not having to work the battery as hard as they would have done if they had been set up for a worse hearing loss. Yes, Bluetooth is certainly a big feature with the Phonak Marvel, but you're right, this is a hearing aid after all. So how good is it at actually helping you to hear? Short version is "better than I expected, but not as good as I would like". The processor for the hearing aid is still the same one that they used in the January 2015 Venture platform, so as expected it's just not as clear or as natural as many of the hearing aids produced by other manufacturers in the four year period since then. However, they have updated the software that runs it to a newer version, so the sound quality was really pretty good and I had no issues hearing clearly when I tried them in a supermarket and a Costa coffee, they just weren't quite as natural as I would have liked. 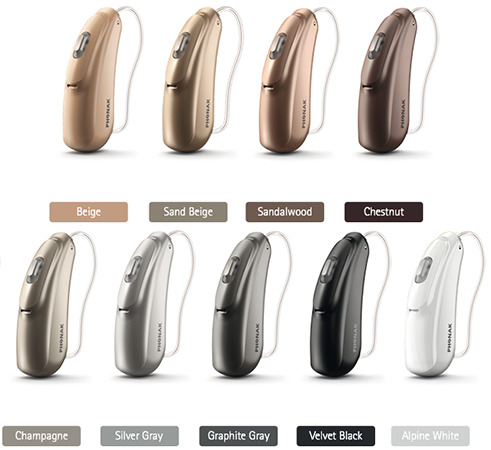 This is a fully automatic, 20 channel premium hearing aid that can discern between nine different environments or can be overridden by up to three manual programs. 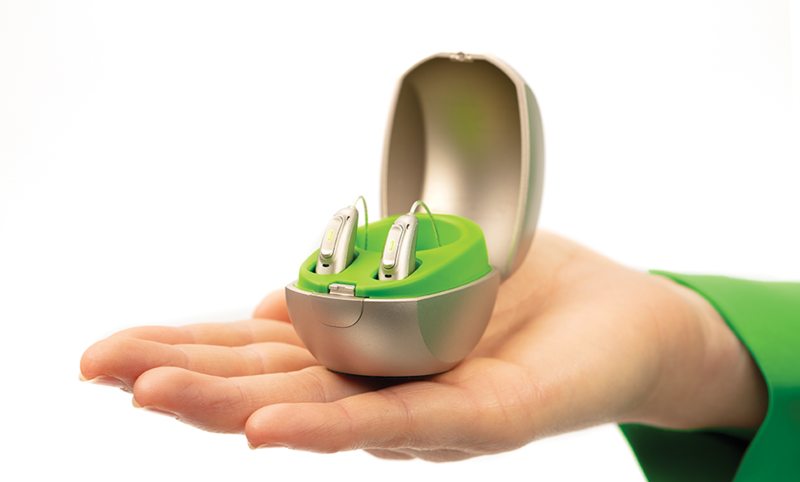 It has all of the usual hearing aid features, as well as Phonak's useful echo blocking and wind noise reduction. It comes in nine different colours and has five different variations, the Audéo M90-R which is the most popular one as it is rechargeable, the Audéo M90-RT which is just the same, only slightly bigger as it houses a telecoil. The Audéo M90-312 which is the slimmest and most discreet but still uses the medium sized 312 battery. Again, there is a model of this with a telecoil, the Audéo M90-312T. Last of all is the Audéo M90-13T which uses the larger battery and has a telecoil. At time of writing, this aid is the best option for Bluetooth streaming and is still sufficiently good as a hearing aid to be more than adequate for the hearing needs of most people. I enjoyed my time wearing these aids and am happy to recommend them. To find out if they would suit you, book an assessment with one of our audiologists either in one of our many clinics or in your own home. Call us on 0800 5677721 or email me at info@yourhearing.co.uk if you would like any further information. Not sure whether to buy the Phonak M90 or spend less on the Phonak M70? Then click here to continue reading about the M70 models.